You already know Blocktrade.com is in the process of obtaining an MTF license under the MiFID II framework, that we are focusing heavily on security and performance and that we have a great customer service team all set up to give you the best trading experience. Now, we are incredibly excited to finally show you the product that we have been working on for the last year. The beta release is available at https://blocktrade.com. Blocktrade.com is currently in the beta testing phase and we will really appreciate you testing it and giving us your feedback. To streamline the process and align it with your expectations, we have prepared an overview of what you can do in the beta. Let's dive in! The beta testing phase starts on July 25 and closes on August 25. We will use all your valuable feedback to do the necessary upgrades and make sure the Live version exceeds your expectations. Using the blocktrade.com beta version does not require you to undertake the KYC process. This means you can focus 100% on the trading experience. As a valued beta user and tester, you will get an invitation to undertake the KYC prior to the live version of the platform so once we launch it, you will be able to trade without waiting. Blocktrade.com beta release enables you to do paper trading and its default currency is EUR. Upon successful registration, you receive 25,000 EUR, 2.5 BTC, 25 ETH, 2.5 BCH, 2500 XRP and 25 LTC. You can start trading right away. Trading on the beta functions the same as if it was live – every order is put on the orderbook, the price is formed by matching these orders. We have also enabled the order cancel option, so make sure you try it as well. Your Feedback can be rewarded! Our Customer Service department already enabled the full functionality of the customer support flow. 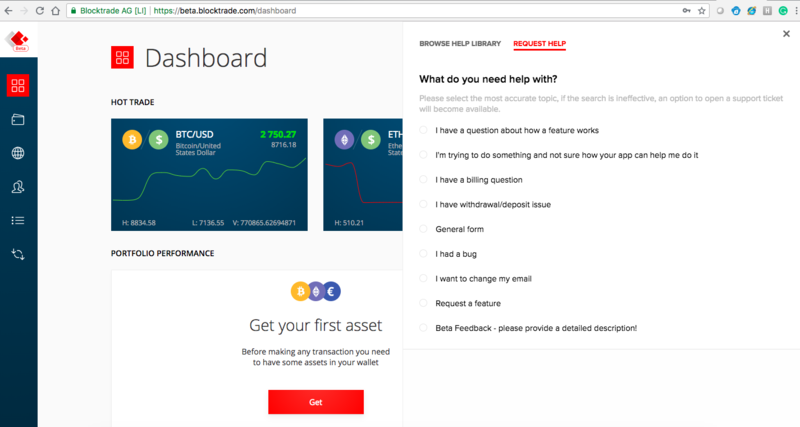 Therefore, we warmly welcome you to use the Need help widget in the bottom right corner, choose Beta Feedback option on the Request Help tab and provide us your view and experience with beta.blocktrade.com. Everyone who sends their feedback will have the opportunity to enter the prize draw and win an iWatch! 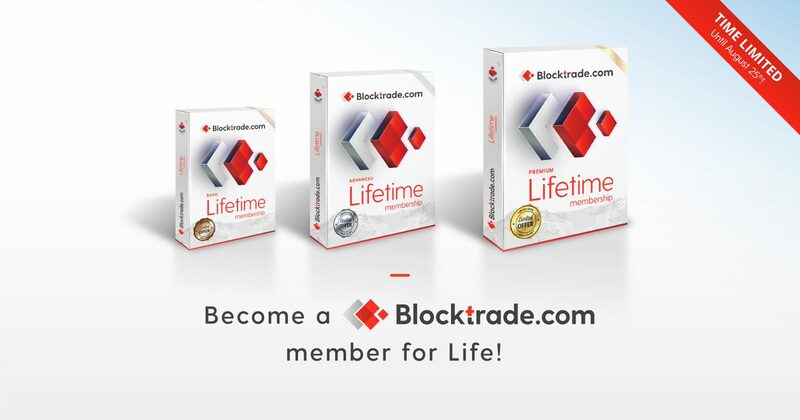 During the beta testing phase, we have prepared a special offer that enables you to become a Lifetime member of the Blocktrade.com exchange. Membership packages bring you a variety of benefits, from extremely low trading fees to additional customer service possibilities. During the Lifetime Membership Offer, you can purchase your package with one-time payment with BTTs and enjoy the advantages forever. IMPORTANT: You will be able to see our wallet address solely and exclusively once you are registered into the beta.blocktrade.com platform. We will never publish it publicly, so do not send your BTTs to addresses you might see on Twitter or other social media! The Blocktrade.com Memberships will be available on the live platform too, but for regular monthly or yearly subscription. If you purchase your package during the Lifetime Membership campaign, you ensure yourself the selected membership package without any additional payments. We will inform you about your Lifetime membership status after August 25th and send you the invitation to the priority KYC procedure.